Penthouse terrace at The Boome, New York City. So much happens in New York on a monthly/weekly/daily/hourly basis that it is essential to check in regularly lest you miss something absolutely, positively not to be missed! Row NYC has a whopping 1331 contemporary guest rooms, from standard to penthouse, over 28 floors, all sitting at the epicentre of the action in Times Square (rownyc.com). 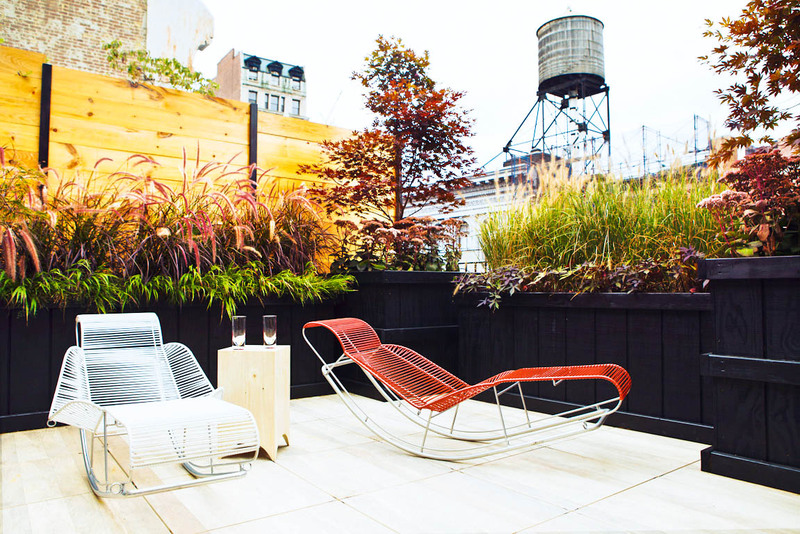 Meanwhile The Broome Hotel in SoHo is a much more boutique offering, with standard and deluxe guest rooms, junior suites and a full-floor penthouse with a gorgeous roof-top terrace overlooking an iconic downtown vista of historic buildings and water towers (thebroomenyc.com). On the food front, Dominique Ansel, the man responsible for the cronut, has come up with a mod turn on the traditional milk and cookies after-school snack that is too cute for words: his Chocolate Chip Cookie Milk Shots are hard chocolate lined cookie cups filled with chilled milk, available from his SoHo bakery after 3pm (dominiqueansel.com). Uptown, Sprinkles Cupcakes New York has a newly installed cupcake ATM – just punch in your order, pay the $4 asking price and out comes your sweet treat, individually packaged for your pleasure (sprinkles.com). And as for things to do, book a table at the iconic Tavern on the Green, the Central Park institution that has just reopened after being shuttered for four years while undergoing major renovations. Also, visit the recently expanded Brooklyn Bridge Park with its new roller rink, complete with skate hire, covered bocce spaces, outdoor fitness machines and basketball courts. or secure a place on Australian TV host Indira Naidoo’s tour of the hidden sky-farms of the city, from Brooklyn to Queens to Long Island (studytours@reho.com).